Another amazing scent composed by Germaine Cellier. Jolie Madame has a leather base which assures, as Cellier fragrances do, that even if it's sweet like candy, there is still a tough gal you're dealing with under her perfectly fitted dress suit. Jolie Madame is not my favorite Cellier, but like many of her fragrances, it contains a contradiction in the notes which fascinates and must have reflected what it was like being a woman in the '50s. The almost sickly sweet top notes of tuberose, gardenia and jasmine undercut with the butch notes of leather, musk, castoreum and civet, demonstrate in perfume form that a '50s woman may have appeared all smiles and pleasantness but underneath she could be the toughest person around, or, to be less literal, more complex than those florals would suggest. This is a fragrance that reminds me of my beautiful mother. This smell reminds me of her in my childhood. Once, 18 years ago, I found a half used bottle at a resale shop. I bought it and once again she wore it and I enjoyed it as her essence. I wish you will wave your magic wand and bring back Jolie Madame for me please. Thanks for the lovely comment, Constance. There is a quote from Proust about how perfume is both fragile and yet faithful and enduring. It is so special that you can remember both your childhood and your beautiful mother when you think of or smell Jolie Madame. I dont need to wave a magic wand to get you closer to Jolie Madame; the vintage version is around, in decants on theperfumedcourt.com, and on eBay. If I were closer to my vintages (a friend is safe-keeping them for me), Id send a decant for you. Thanks for stopping by! Jolie Madame is my all time favorite...errr, well one of them! There seems to be so many. I have a hard time finding it and fear someday it will be all gone. Are they still making it, do you know? I wore this in my youth ( who knew I was such a sophisticate) and love it still. I just ordered Nocturnes D'Caron and can't wait to try it! Ma Griffe is one I used to wear and now that your lovely blog has remained me of it, I must find some of that also. I am thrilled to have found you. Thank you! Glad you found Yesterdays Perfume! As for Jolie Madame and Ma Griffe, those can still be had in vintage form on eBay at various bidding prices. The buy now prices are over $100, but if you bid at the last second, you could get a deal. Sadly, JM and MG — both chypres with oakmoss — are no longer being made, in part because the style is out of vogue, and also because regulatory agencies have severely restricted how much oakmoss can be in perfume, effectively wiping out what sounds like your favorite perfume category. Go get em! Some years ago i found a 4fl oz bottle of jolie madame in a car booth sale in the uk. I really liked the smell and looked to try and find it in the shops in the uk but could not. can anyone tell me where to buy this perfume. My bottle look really old I think i may have one of the original bottles. I have an old bottle of Jolie Madame I got on eBay and while I like it I think the top notes are gone because I get very little floral. I think I would like it better if I got that great dichotomy you mentioned, between the florals and the leather. I still like it, though, and wear it every so often. By the way, I'm glad I found yesterdays perfume! I love it! 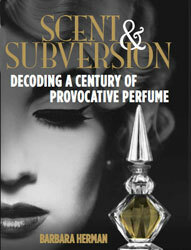 And I read Scent and Subversion all the time, and have my daughters reading it, too. Thank you for your perfume passion!